The First Lady of these United States has declared war on Chick-fil-A. It seems the home of plump juicy breasts and hot buttered buns has run afoul of the new Smart Snacks in School program. The program is a component of Mrs. Obama’s Healthy, Hunger-Free Kids Act of 2010. The new government regulations require snack items served in public schools to have less than two hundred calories. That includes vending machines, lunch rooms and other campus food venues. And that’s really bad news for kids at South Carolina’s Socastee High School. They’ve just learned they will no longer be allowed to buy Chick-fil-A sandwiches at school. 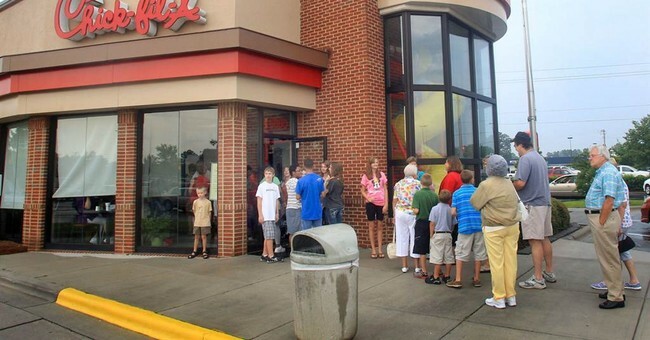 Hunger pains aside, there’s another consequence to the Chick-fil-A ban – all the profits funded field trips for the school’s special education students. Maybe they could get the math students to figure out how many carrot sticks they’ll have to sell to send the youngsters to Six Flags. Ever since Mrs. Obama named herself as America’s Lunch Lady, students across the fruited plain have been in full-scale rebellion. The government mandated smaller portions have been met with great resistance – especially in farming communities. School leaders are bracing for the outrage when returning students learn that there won’t be any more bake sales. No more cupcakes. No more Cheese Doodles. Just bottled water and fat-free kale chips – all thanks to Mrs. Obama’s meddling. Remember that the next time you see Mrs. Obama scarfing down and burrito chili cheese fries — while telling the rest of us to eat our Brussels sprouts.